Hot flashes can be difficult to manage, and they can seriously interrupt normal daily functioning or even make it difficult to sleep at night. Luckily, there are some ways to help improve symptoms of hot flashes. 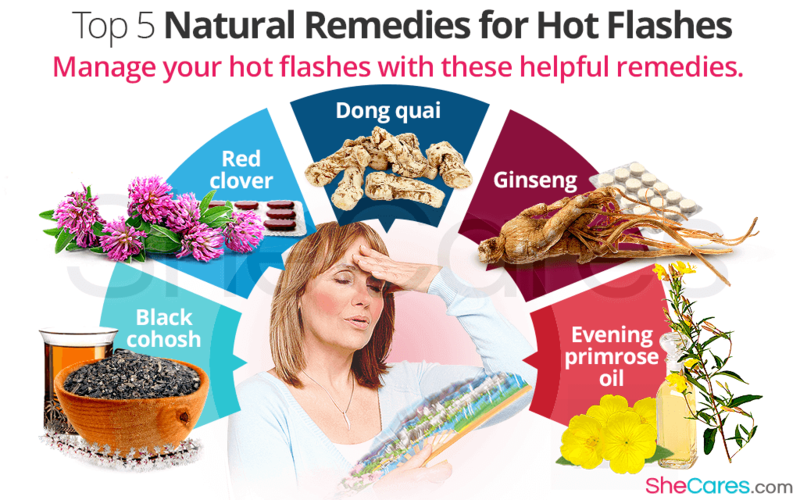 A number of herbal remedies for hot flashes have become popular for women going through menopause. This herb has some of the most promising effects on menopause symptoms, especially on hot flashes. While studies have shown mixed results, many women who have begun to take black cohosh report significant impact on the frequency and severity of their hot flashes. The scientific consensus has not been reached, but it is likely that this herb is a useful natural remedy for hot flashes. Black cohosh can be taken in capsules or tea, and it may cause liver problems, although more studies need to be done on this potential side effect. Like black cohosh, scientific studies on red clover have come back with a variety of results, but many women can attest to its use as a hot flash natural remedy. It does not appear to have many side effects or cause any long-term health problems, but women who have reasons not to take estrogen or other hormones should use caution with this herb. An ancient Chinese herb, dong quai has been used to treat women and their health problems for thousands of years. Few scientific studies have been done on this herb, so little definitive is known about its effects. It is known that dong quai can affect bleeding and blood clotting, so it should not be taken by women with fibroids, blood-clotting illnesses, or on drugs that affect blood clotting. While studies have proven that ginseng may help other symptoms of menopause, no study has yet discovered it to have an influence on hot flashes. However, many women still use it as a hot flash natural remedy and claim that it can improve their symptoms. Another herb with no scientific studies backing its use as a natural remedy for hot flashes, evening primrose oil is still popular among many women for its ability to soothe their symptoms. This herb has a number of side effects, however, including nausea, diarrhea, and difficulty with the immune system. It also can affect blood clotting, and it seems to have a detrimental effect on people suffering from schizophrenia and those taking phenothiazines, a class of antipsychotic medications. These remedies can help you to manage your hot flashes and keep yourself functioning normally on a day-to-day basis. To learn more ways to manage hot flashes, read about which vitamins help with hot flashes.